Tonight: Mostly clear with lows into the 60s. Light and variable. Monday: Warm and a bit humid. Mostly sunny. Highs in the 80s for most, 70s at the coast. Tuesday: Warm and a bit humid. Mostly sunny. Highs in the 80s for most, 70s at the coast. With less and less daylight it’s more and more difficult to see temperatures reach the 90s this time of year. If you live right at the coast, temperatures stayed in the 70s. Southern New Hampshire and the Merrimack Valley were HOT! As of this blog post, Boston was in the 90s. Throughout New England: Keene, NH: 94°; Lebanon, NH: 91°; Springfield, MA: 91°; Hartford, CT: 90°; Fitchburg, MA: 90°; Burlington, VT: 90°. The heat will persist for the next couple of days. The heat will be short-lived, however. 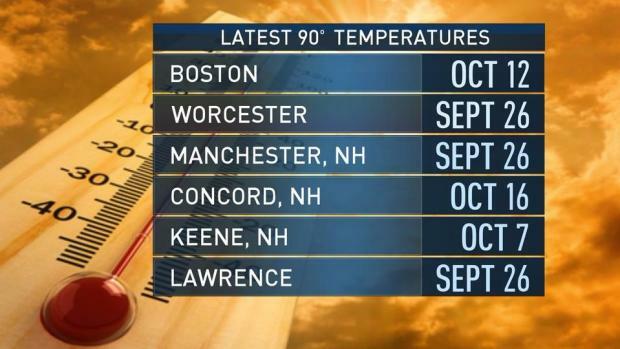 In Boston, the latest 90° day recorded is October 12th. In Concord, NH it’s October 16th and in Keene, NH it’s October 7th. For Lawrence, Worcester and Manchester NH it’s September 26th. The previous three locations all reached the 90s on that day in 2007! This round of heat will break with a cold front. The timing of that front keeps getting pushed back and the temperature drop is appearing less and less significant. That cold front will also help kick Maria out to sea. It’s still possible the Outer Banks of North Carolina could see tropical storm or hurricane conditions. Locally we will only see indirect impacts: high surf and an increase rip current threat. Next weekend looks like a fall beauty. Temperatures will climb into the 60s and low 70s with full sunshine. Cue the apple picking and leaf peeping!